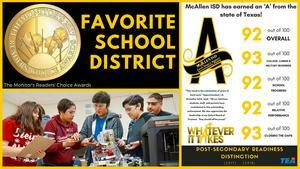 McAllen ISD has hit it out of the park with a bevy of major awards from the state and beyond. The district earned an ‘A’ Accountability Rating from the state of Texas, another Post-Secondary Readiness Distinction and three awards in school finance! The Texas Education Agency released results August 15 to the public showing the accountability ratings and the Post-secondary Readiness Distinctions that have been earned for the 2017-18 school year. The following chart illustrates these achievements. It shows the percentage of Texas school districts earning an ‘A’ at 12.75%. The percentage that earned the Post-secondary Readiness Distinction was even fewer at 5.08% and the percentage that earned both is a mere 3.58%. McAllen ISD’s overall scaled score is 92. A score of 90-100 is considered an ‘A’ in the new Accountability Rating System. The 85th Texas Legislature passed House Bill (HB) 22, establishing three domains for measuring the academic performance of districts and campuses. The Student Achievement category measures how well students performed on the STAAR (State of Texas Assessments of Academic Readiness) for elementary and middle schools and End of Course (EOC) exams in high school along with how well high school students performed on college and career readiness measures plus their graduation rates. School Progress is broken down into two sub-categories (Academic Growth and Relative Performance). Student Progress-Academic Growth scaled score of 84% looks at how many students improved on the STAAR performance in Reading and Math compared with the previous year. Student Progress-Relative Performance measures how well campuses and districts perform in relation to their percentages of low-income students. The highest score from Domain 1 and the two sub-categories in Domain 2 (in McAllen ISD’s case, a 92) is used for the calculation of the overall school progress score as per the Texas Education Agency 2018 Accountability Manual. Closing the Gap measures how well sub-populations of students perform based on their race, income level, disability and other factors that might impact learning and is used for the remaining part in the calculation of the overall progress score. The state legislature approved the new A-F rating system in 2015. Campuses will receive A–F ratings beginning in 2019. The Postsecondary Readiness Distinction takes into account factors such as performance on state exams, high graduation rates, high ACT/SAT participation, Career and Technical Education (CTE) graduates, and Advanced Placement/International Baccalaureate performance. For elementary and middle school, the criteria include performance on state accountability tests. In McAllen ISD’s continuing pursuit to be good stewards of the public’s dollar, the district recently earned three major awards in the international and state arenas. These include the Meritorious Budget Award (MBA) – an international standard – for the submission of the 2018-19 Annual Budget Book. This is the fourth straight year McAllen ISD has earned this award from the Association of School Business Officials International (ASBO) – the highest recognition in government budgeting. In previous years, the District was awarded the Distinguished Budget Presentation Award from the Government Finance Officers Association (GFOA) for fiscal years 2016 and 2017. Preparing the budget involved teamwork from the district’s Business Services, Human Resources and the Department of Technology. In addition, McAllen ISD is one of just 26 school districts in the nation to earn the prestigious 23rd Annual Achievement of Excellence in Procurement® (AEP) for 2018 from the National Procurement Institute, Inc. (NPI). The AEP is awarded annually to public and non-profit organizations in the US and Canada for innovation, professionalism, e-procurement, productivity and leadership in the procurement function. For the 15th time in 16 years, McAllen ISD has received the state’s highest mark by the Texas Education Agency’s School FIRST (Financial Integrity Rating System of Texas). The district did it with a perfect score – the eighth straight year it has earned perfect marks. The 2018 rating is based on the annual financial report provided to the Texas Education Agency by the district from the 2016-17 school year. The Superior Achievement rating serves as an indicator of the quality of the district’s financial management and reporting system. Offering chess in elementary through high school (5 state titles since program’s inception in 2016. 22 teams qualifying for national competition in 2018). A Career Technical Education program which offers 38 college certifications, 94 elective courses, 12 four-year graduation plans, 15 career clusters and 27 statewide articulated courses for college credit. McAllen ISD also places strong emphasis on teacher training and development providing the support they need to ensure student learning. As the district continues to promote lifelong learning in students, it continues developing the skill sets and emotional intelligence of its educators. This builds a strong instructional core and sense of belonging since the development of high-quality educators is key to successful student achievement.